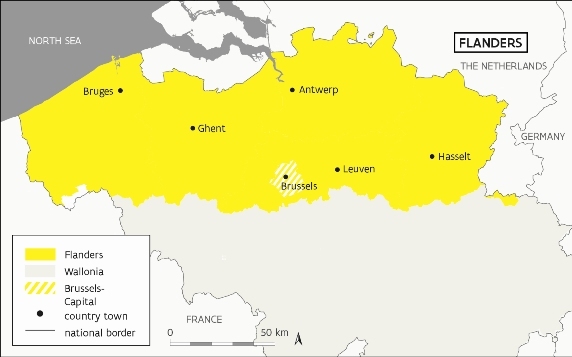 Flanders is the northern federated state of Belgium with Brussels as its capital. It is often called “the crossroads of Europe” and shares its own capital with the EU, NATO and numerous other international institutions and companies. Its location in the heart of Europe, made Flanders an unique European transportation hub. Flanders exploits its central position to the fullest, and offers companies rapid and efficient supply and distribution links with other major European centers and beyond, despite its fairly compact geographical dimensions. The region has four world-class ports, the most concentrated waterway network in northern Europe, three airports for cargo and passengers, and an extensive rail network for national and European destinations. Furthermore, Flanders contains a high density of freeways connecting directly to other European countries. The Government of Flanders is committed to creating an optimal business climate for the territory. A wealthy and diversified economy arose from the regions policies, with sound budgets as its baseline. The main financial task for the future consist of the constant reassessment of the established strategies due to growing international competition. In order to tackle these challenges, the Government of Flanders wants to further strengthen Flanders’ economic and innovative potential, in order to have it rank among the top European regions in 2020.